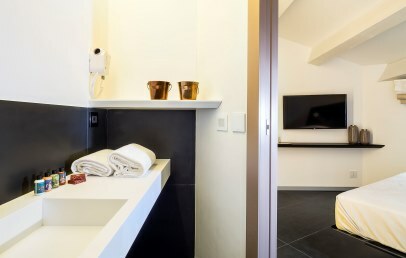 A fresh homage to films set in Sicily, Duomo Suite & Spa is the ideal choice if you wish to immerse yourself in the vibrant Baroque heart of splendid Catania, a few steps from Piazza del Duomo and via Etnea. 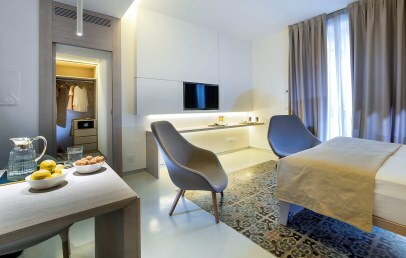 Duomo Suite & Spa stands in the historic heart of Catania, among majestic buildings and lively streets and avenues. From the hotel, you can take pleasant strolls among the city's main cultural attractions, as well as the shopping streets, the colourful historic markets and the most popular bars and restaurants. Renting a car you can discover the many beauties of Eastern Sicily strewn all around the city: Etna, Taormina, the Cyclops' Riviera, Siracusa and Val di Noto. 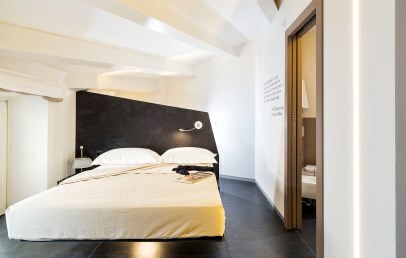 The hotel is an early 18th-century building whose balconies provide a view of the stately Baroque scenery of piazza del Duomo, with the imposing cathedral and the iconic Elephant fountain. 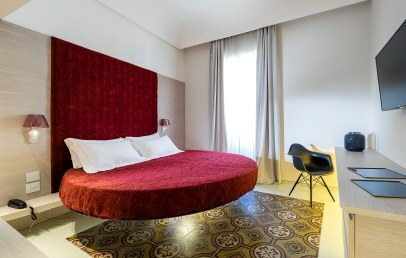 Arranged on the four floors of the hotel, the splendid rooms are furnished in contemporary style inspired by Sicilian films. From the Spa to the lounge bar, from the rooftop terrace to the winter garden, the common spaces are designed as areas for the guests' relaxation. 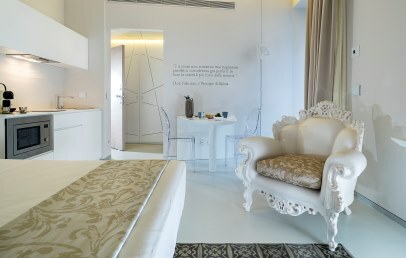 The hotel has 12 modern rooms, all in white with different, striking details, which have a common thread, inspired by a different Sicilian-themed film as The Godfather, Cinema Paradiso, the Postman… Each room pays homage to a film of international fame set in Sicily or in any way aligned to Sicilian culture. 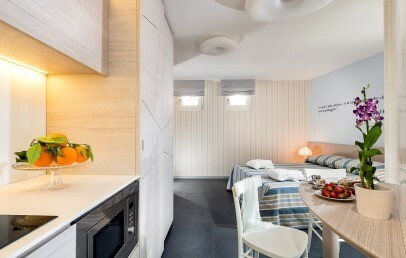 Each room is independent and is equipped with a lots of comforts: double bed, foldable pouf, non-allergic pillows and duvet, independent heating/air conditioning, electronic safety-box, satellite TV, Internet TV, Wi-Fi connection, minibar, bathroom with shower, hairdryer, USB port for data transmission and smart phone recharging, microwave, kettle with a selection of teas, coffee machine Nespresso. A real wellness oasis offering a welcome break from the strain of our busy lives. Guests can enjoy the Turkish bath or opt for one of the treatments provided by experienced professionals. Guests have free access to the hammam and common spaces and complimentary Wi-Fi connection available throughout the hotel. The following services are available at an extra charge: breakfast, the Spa treatments and public parking "Paolo Borsellino" at approx. 400 m distance. 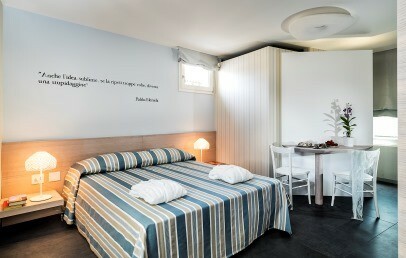 Stromboli, Il Postino, Il Giorno della Civetta... Each room pays homage to a famous Sicily-themed film in its design, colours and furniture. 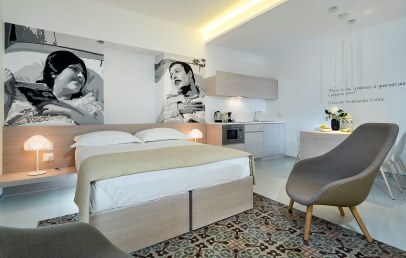 Il Gattopardo, La Terra Trema, Malena... Each room pays homage to a famous Sicily-themed film in its design, colours and furniture. 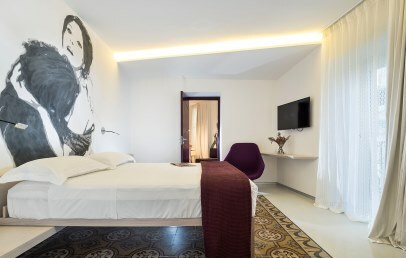 Sedotta e abbandonata, Paolo il caldo, Il Padrino, Johnny Stecchino, Suite Isole... Each room pays homage to a famous Sicily-themed film in its design, colours and furniture. The 'Isole' Suite comprises the rooms Stromboli and the Postman, connected by a common hallway, yet relatively independent. The Suites have futon or single beds in the living room, and may have a balcony. 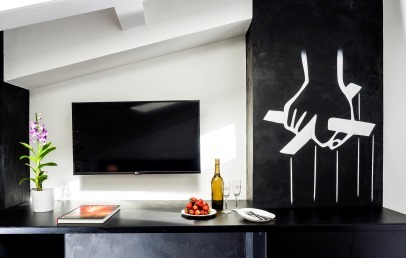 Comprising the rooms Malena and Cinema Paradiso, the Tornatore Suite is a charming, very spacious suite paying homage to the great Sicilian filmmaker. 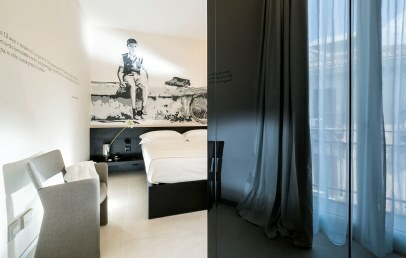 The Visconti Suite is dedicated to Luchino Visconti and has the connecting rooms Gattopardo and La Terra Trema. 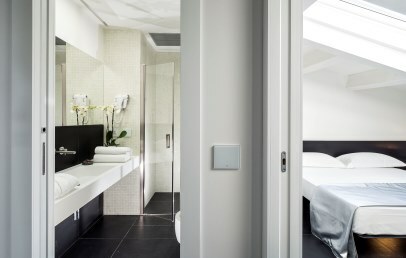 The two Luxury Suites have a double bed and sofa bed and two en-suites with shower. 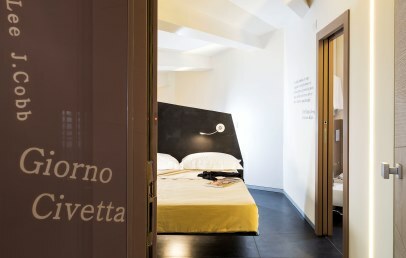 The rooms Il Padrino (the Godfather) and Il Giorno della Civetta (the Day of the Owl) make up the Suite Cosa Nostra, a large stylish unit highly suitable for families with children. 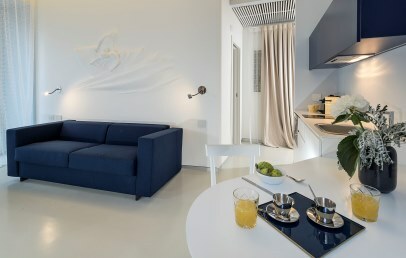 The Royal Suite has two double beds, a living room with a sofa bed and two en-suites with shower. 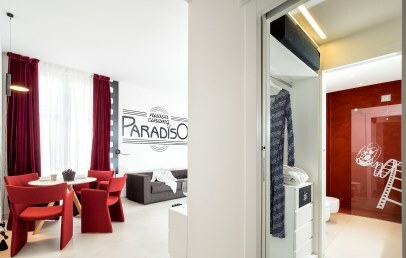 Nuovo Cinema Paradiso, Divorzio all’Italiana... Each room pays homage to a famous Sicily-themed film in its design, colours and furniture.